Sakari is a business text messaging service to send SMS reminders, alerts, confirmations and marketing campaigns. 100% Free forever trial. No credit card required. Register for an account and receive 100 free messages. No contract or credit card required. Send your first message in under 5 minutes. No technical knowledge required. Your customers prefer to use text messaging. Communicate where they already are. 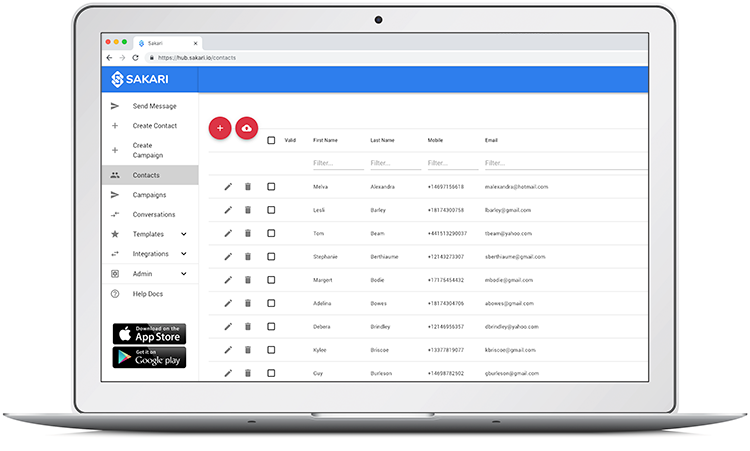 Sakari is built for teams to send and receive SMS with thousands of contacts. Easily integrate Sakari with over 1,300 other applications using our SMS API and integrations. Business features, including branch accounts, multiple users and more. Manage your campaigns using our iOS and Android mobile apps. A simple messaging API to connect directly to your systems. Setup a dedicated phone number and send and receive SMS online. Add rich pages to your messages with maps, images and more. Bulk features to easily send SMS to thousands of contacts. According to a recent Customer Think report, customers prefer to communicate via text messaging.